Energy needs vary widely between individuals and must be addressed separately from other nutrient requirements. Nutrient requirements should not be fulfilled by a fixed percentage of the amount of feed the horse consumes. With compounded feeds the added nutrients (proteins, minerals, vitamins, salt, etc.) are force fed into the horse at indiscriminate amounts in order to meet the energy requirements and to maintain body weight. Increasing or decreasing a compounded feed based on weight maintenance of the horse cannot provide the required nutrients at the low feeding levels without over-supplementation of the nutrients at the higher feeding levels. Excessive supplementation of any nutrient, even if the nutrient is not toxic, requires metabolic and organ functions in order to eliminate the nutrient from the body. This is a waste of valuable resources whether in the form of enzyme activity, energy, or organ usage such as the kidneys. Inadequate supplementation of nutrients unrelated to energy often results from low consumption levels of compounded feed. This can occur with a voluntary decrease in feed intake due to illness, injury, etc. ; or with the caretaker's feeding restriction for the control of obesity, metabolic syndrome, etc. Probably, the most perplexing example of the problem of linking energy with the other nutrients is how to manage the diet of a highly conditioned horse on idle days or injury lay-up days. There is a risk of tying-up if complete feed is continued at high levels. If the feed is reduced, there is a risk of creating a nutrient deficiency. It is an advantage to have the capability to adjust caloric intake to meet the horse's energy needs without affecting the basic nutrients. 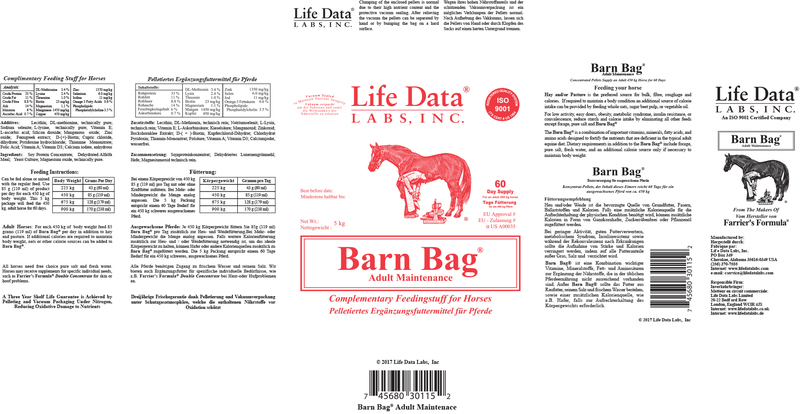 Barn Bag® provides balanced nutrition when fed with pasture, hay, and whole oats. Grass hay or pasture should be considered the basic diet for the horse. The demands of additional work, along with less grazing time, require the addition of concentrated energy and other nutrients into the diet. Oats are the best solution for this purpose. Our research and experience substantiates the combination of grass hay and oats require the least amount of supplementation to balance the diet. Oats provide the best grain foundation to be added to the diet balancing pellets because of their energy content, palatability, amino acid content, starch digestibility, fatty acid ratio, calcium to phosphorus ratio, and lower phytate content. Oats are an exceptionally good source of energy because the nutrients contained in oats are efficiently utilized in the production and burning of calories. The demands of additional work, along with less grazing time, require the addition of concentrated energy and other nutrients into the diet. Oats are the best solution for this purpose. Our research and experience substantiates the combination of grass hay and oats require the least amount of supplementation to balance the diet. Oats provide the best grain foundation to be added to the diet balancing pellets because of their palatability, amino acid content, starch digestibility, fatty acid ratio, calcium to phosphorus ratio, and lower phytate content. Oats are a good source of energy because the nutrients contained in oats are efficiently utilized in the production and burning of calories. Salt should be given separately, usually free choice. Giving a salt and mineral mixture such as a mineral block forces excessive mineral intake. Hay provides the bulk, oats provide the energy, and the Barn Bag® pellets provide the nutrition.